Parrot Drones has been quiet of late, but the company launched a salvo against DJI, the market leader, with the announcement of the Parrot Anafi. It’s about damn time too. While a fan of DJI, we all want to see the camera drone market pushed forward. The company has unveiled the Anafi, a folding drone that takes some not-so-subtle potshots at DJI's Mavic Air. It's not just the portability -- the Anafi touts a 21-megapixel camera that promises 4K HDR video at 100Mbps, including 2.8X lossless zoom. The camera isn't good as the Mavic Air's in some respects, as it's only using two-axis mechanical stabilization (software and a wide lens handle the third axis). Still, it represents a big improvement over the 1080p video and no-gimbal design of Parrot's Bebop drones. Parrot CEO Henri Seydoux detailed at the launch event how the company studied insects like bees to figure out the best place to insert the camera for maximum visibility. In the end, Parrot chose to place the 4K camera where an insect’s head would go, which places it far enough away from the rotors (or wings) that these will never enter the camera’s view, no matter what angle you point it. This allowed Parrot’s team to put its camera on a 3-axis gimbal with 180 degrees of vertical range. While your drone hovers in place, you can point your camera directly upwards or directly downwards using the controller triggers. Most drones can film directly downwards, so this kind of upwards visibility is unique. Anafi’s design will help filmmakers and adventurers get better shots of objects without having to be directly above or in front of them. Once you’re done flying for the day, your drone folds down into a cylinder, about the size of a skinny Amazon Echo Plus or tall water bottle – 9.6 x 2.6 x 2.5 in (24 x 6 x 7 cm) in all. 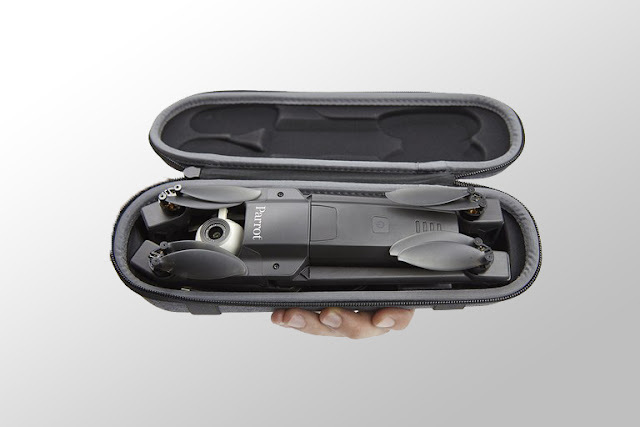 Inside of its “Cocoon” carrying case, as the engineers jokingly called it, your drone bug can be easily transported in any bag, but it’s slightly too large to comfortably fit in your hand or any pants pocket. Still, it only weighs 320g (0.7 lbs / 11.3 oz), much lighter than the Dji Mavic Air’s 430g and just above the DJI Spark’s 300g. 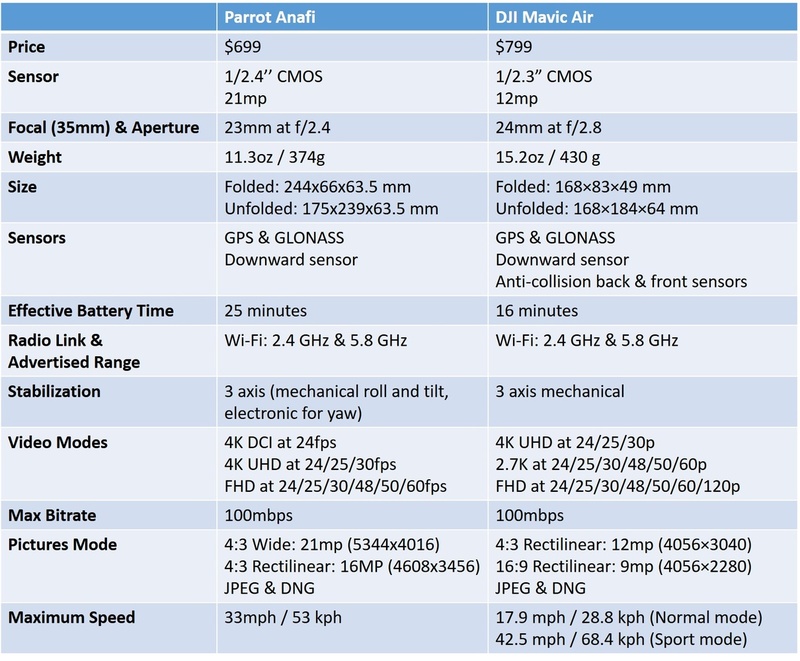 Perhaps because of that lightness, you don’t need to worry too much about drone buzzing: Parrot claims that Anafi measures nine decibels quieter than the DJI Mavic Pro. 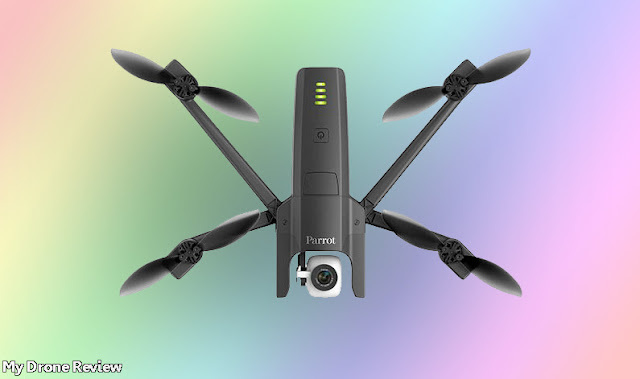 During Parrot's launch presentation, up to four drones flew around the room at once, and the buzzing truly wasn’t that noticeable compared to the noise of the crowd. While the drone itself is arguably more compact than the Mavic Air, the same can’t be said of the Skycontroller 3 remote that comes with it. Its phone holster folds down, but it’s still quite a chunky controller that will be more difficult to transport. It also lacks the removable thumbsticks of the Mavic Air’s remote controller, which adds to its overall size. At 386g, it also weighs more than the Anafi drone itself. 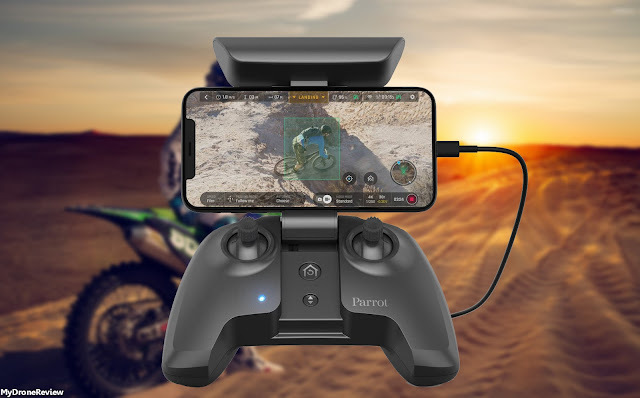 The controller will, however, instantly connect to the drone once you unfold it, meaning you can be off and flying much quicker. There are also convenient zoom controls available from the shoulder buttons. Both the drone and controller have a USB-C port for charging, which is most welcome. You’re also able to top up the battery from a range of sources including portable battery packs or your phone’s charger. That’s great news and a convenience not always available on other drones. 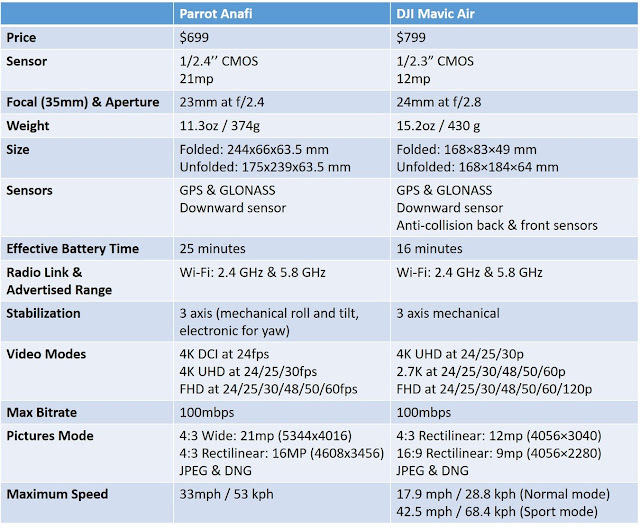 Parrot is saying flight time should be around 25 minutes, which compares favourably against the DJI Mavic Air’s rated 21 minutes of flight time. As an aside for anyone wondering what the name means, it’s apparently an island just off Greece. Keep that in your pocket for the next pub quiz. The Parrot Anafi includes a 21 MP camera, a 180-degree gimbal tilt, 4K HDR video at 30 FPS and 1080p HDR video at 60 FPS. Parrot has also mentioned that the Anafi will be able to zoom in up to 3 times, but that full HD shots will only be able to be made at up to 2 zooms. The camera itself is able to both digitally and mechanically stabilize all captured photos, too! The Anafi uses a 3-axis gimbal stabilization system with, as we just mentioned, 180 degrees of tilt. This means that the drone is not only able to look down, but it’s also able to look straight up into the air. This allows for a much broader range of user freedom when it comes to getting the best shots possible, allowing for footage in the best directions. Not only will we be getting the new Anafi, but we will also be getting a new application, as well. The new FreeFlight 6 app will allow users to select 21 MP or 12 MP photos, as well as being able to adjust their video modes. One such video mode is hyper-lapse, which allows for speed footage at a rate of up to 240 times, slow-mo video, and even a high frame rate mode that allows users to film at a rate of up to 60 FPS. The FreeFlight 6 app is available for both iOS and Android systems, which connects your phone to the Anafi controller using a USB-A cable. 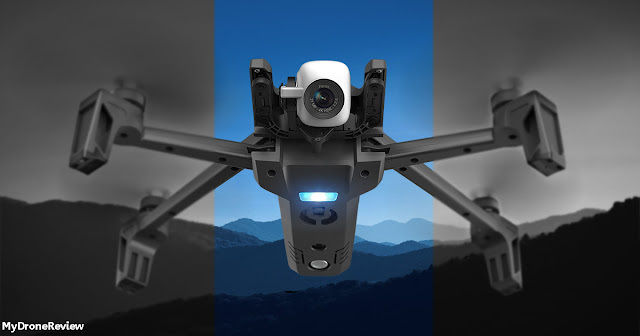 Parrot has backed this type of connection because it improves the connection with the drone and allows for constant video streaming. Though this is an arguable opinion, it would seem from everything we’ve seen from Parrot before, they are now getting down to business and creating more professional drones for their lineup, which is proven by the Anafi. Though their previous drones have seemed to be more toyish, the Anafi is bringing aerial photography and videography to an entirely new level, which is made better by the fact that it’s a foldable drone. Compared to the Bebop 2, the Anafi is 35% more quiet and, as we mentioned, more technical and has excessive improvements made. While the Bebop 2 had issues connecting at times, Parrot is confident that the Anafi will have no trouble remaining connected at all times. Gone are the days where your signal is lost! Because the Anafi has a total of 4 antennas, each on the feet of the drone, as well as to the physical controller, maintaining a WiFi connection will be no trouble at all. What’s more, it also has a maximum transmission range of up to 2.4 miles and is able to switch between 2.4GHz, 5GHz, and even 10MHz bandwidths without you having to switch them. That’s right, the Anafi does it automatically. The Parrot Anafi will sell for a competitive $699 when it arrives in July. That converts to about AU$915 and £520. Although I haven't seen video straight from the drone yet, the feature set and design are solid and if the experience is as good or better than the Bebop 2, we might finally have a worthy alternative option to DJI's Spark and Mavic Air.